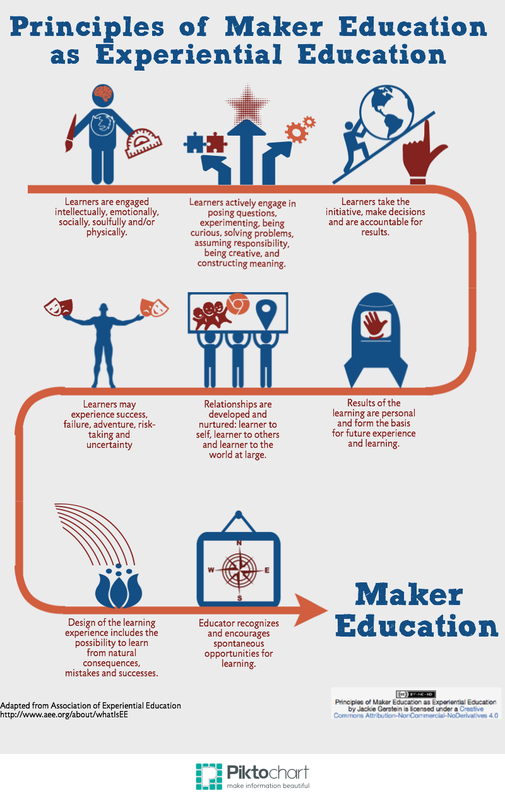 As those who follow me on Twitter and via this blog know, I am an advocate of the Maker Education movement. The reason, as I’ve mentioned, is that I come from a background in Experiential Education. Many of underlying principles and learning activities related to maker education fit nicely into the tenets and principles related to experiential education. Since this discipline-learning philosophy has been around a lot longer than the more formalized, current maker education movement, those attempting to move maker education into more traditional educational settings might draw from the writings and literature of experiential education to help explain and contextualized maker education. 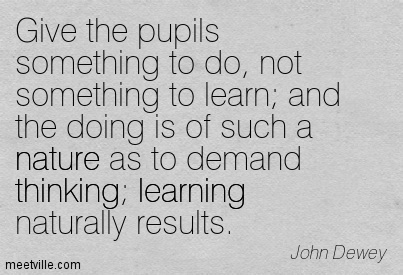 Many look at the philosophy and writings of John Dewey as providing the foundation of experiential education. Paula Hogg in her post Why Dewey would applaud the maker movement in schools provides more insights about the connection of Dewey’s ideas with Maker Education. In a maker environment children are at the center of the learning and it’s the child’s interests that drive the activities. This echoes the thinking of John Dewey John Dewey who said in My Pedagogical Creed “The child’s own instincts and powers furnish the material and give the starting point for all education” Dewey believed that all too often children are passively absorbing facts from the teacher and learning through play, exploration and inquiry is sidelined for strict discipline. Instead he thinks school should be places where children are actively learning through their own experience and working together helping one another and sharing the tasks. Doing and learning through play, tinkering, exploring and making are critical components of maker education. The Association for Experiential Education, established in the early 1970s, proposed that the following principles mark the practice of Experiential Education. I took liberty in highlighting those phrases/practices that I believe also characterize Maker Education. Experiences are structured to require the learners to take initiative, make decisions and be accountable for results. The educators and learners may experience success, failure, adventure, risk-taking and uncertainty, because the outcomes of experience cannot totally be predicted. I’m on the same page as you Jackie. Good ideas never seem to fully die, although we sometimes bury them. The truly relevant ones always pop back up, but why don’t more people concerned bout educating the children of today see this. I go back to the days of the ‘open classroom’ taught the way it was meant to be and welcome the Maker Movement to form a partner with all our technology exploration. Next year we have formed a partnership with the Maker Lab at the Peabody Essex Museum in our community. Canj’t wait. I promote any current trend that helps us get back to what I consider primary education – hands-on with sweat and grind; creativity; ahas; and lots of self-directed discoveries! Good luck with the partnership. Classroom becomes an huge lab, educator and students great explorers! They see it as a waste of time because they know that their administration really isn’t going to let them do things that aren’t on the test. Sometimes I tell that I see it as a Trojan Horse to bring back the stuff they used to do. Maker education closely associated with STEM learning, is an approach to problem-based and project-based learning that relies upon hands-on, often collaborative, learning experiences as a method for solving authentic problems. I think is a great method of teach and learn a new thing or language. When you give something for somebody to do, usually the person tries his/her best no to disappoint anybody. Learning with STEAM is quite the same thing. And moreover, when we do any activity, first of all we do no want to disappoint ourselves. KIds develop a bigger interest and motivation through the Maker Movement by developing their maker skills and learning how to support the environment and the world around them. It’s easier for the kids to learn through the Maker Movement, because they can develop skills. Maker movement is an approach that encourages teachers and students to create and learn through the experience of making, instead of analyzing and observing only. Makes movement is also a successful way of building positive relationships with students. Means walking side by side with learners while they become critical thinkers. Giving pupils the space and tools so they can see their capacity of creating something and experimenting for themselves is amazing. Students can use their creativity and technology to their own good, to their community and engage even more in their educational lives. The Maker Movement is interesting because it works with correctness and errors and, in this way, the student learns from they own experience, that is, the error is part of they learning process. Education is passion. You have to be engaged in order to engage others. I love what I do. When you ask a children to do something specially if they need to build or construct, it raises curiosity and also it is challenging, so they are motivated to finish the task with the teacher’s support. When they work in groups it develops communicative and collaborative skills. They are all enagaged to think and find a solution together. They learn by doing. They learn by making stuff and that what the Maker Movement is all about. It is meaningful for students! For me, some information are used, but they are very important to the teacher´s work nowadays. For example, the students being the center of the learning, working with their interests for driving the acitivities, learning meaningful and include them in the real life problems. Many students feel that they aren’t as smart as the other students or that they don’t have personal skills, but if we use the maker education, we will help them to feel more confident and excited about what they can do, what they can create and mostly what they can be! Maker Education belives in students potencials, and respect their differences and prepare students to face the reality, learning from their mistakes. The students learning more doing things and creating something real new.The maker movement brings this colaborative and participative educational opportunity. We live in a changing world so every day we encounter problems and challenges that lead us to questioning. Those questions are the beginning of the MAKER MOVEMENT approach. It all starts with a question and ends with a solution. I believe that school in the past was too focused on teaching people about the past and left students to discover the present in the “real world”, it means only when they were already included in the job/career world. With the maker movement, students have a chance to learn not only with the real environment around them, but also with their own hands. This is what means to be envolved physically, soulfully, socially, intelectually and emotionally. These things are the ones that make any kind of knowledge last. This is realy awesome. Kids can learn faster. It’s great the idea of the students simply learning by doing things, using their imagination and put their minds, bodies and souls to make it possible and get success. It´s wonderful to see the pupils doing their work and have so much fun. They are creating things in a natural way using their thinking by solving problemas and learning how to work in a team. It was awesome to see the excitement in the pupils´faces.